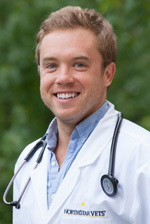 Benjamin Donati, VMD is a doctor in the Emergency and Critical Care service at NorthStar VETS. In this video, he talks about his path into veterinary medicine, the types of cases he likes to treat, and why growing up in this area is an asset to the way he practices. Learn more about the Emegency and Critical Care service at NorthStar VETS. This entry was posted in Pets, Veterinary Medicine and tagged Benjamin Donati VMD, NorthStar VETS, Veterinary Emergency. Bookmark the permalink.